Sometimes, the lack of planning is required. Opportunity stared me in the eye when I saw fresh grade A ducks in the nearby grocery store. I didn’t have any well thought out plan on what to do with it. I just wanted to cook it. So I bought it. As soon as I got in the lab, ideas started coming. First, separate the breast and leg. I decided to brine the breasts in a hoisin and water mixture. The legs were to be cooked confit, though, I didn’t really know what to do with it after. As for the bones, well, the obvious was to roast and make a sauce base. After the ducks have been cured and cooked, I still didn’t know what to do. The usual would be to sear it and crisp it up, but I didn’t want to do exactly that. Then I remembered one of the presentations from ICC that had beef threads. 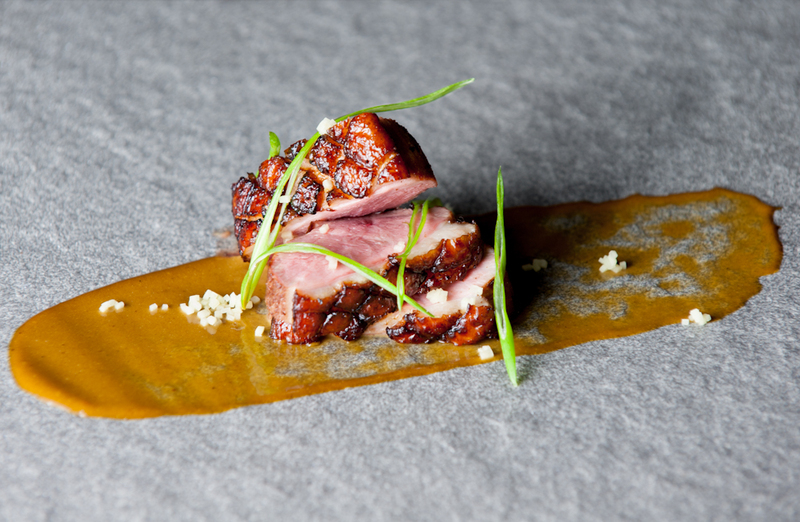 From that came the duck threads (legs were cooked sous vide @ 82c for 6 hours; butter and garlic in the bag). Here are the threads. 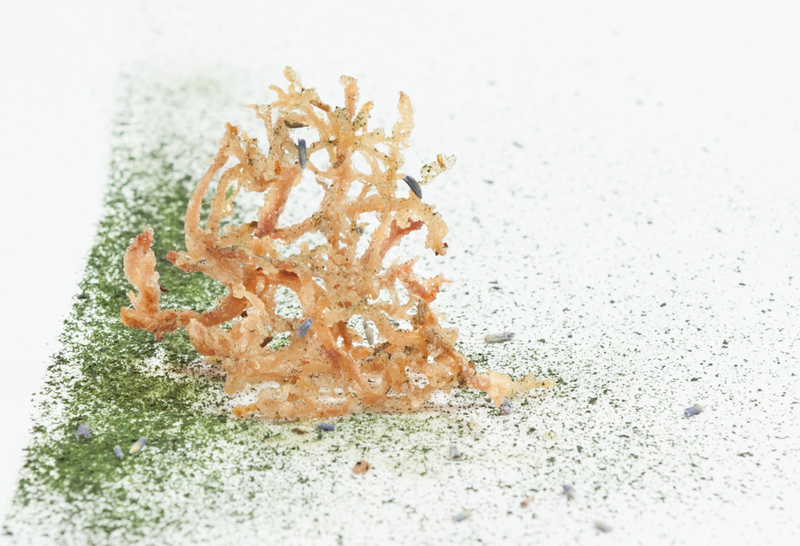 Drizzled with toasted sesame oil, sesame seeds, lavender honey, dried lavender blossoms, and wakame powder. So, finally after a whirlwind work trip, I’m back. Needless to say, I’m too happy to be in the kitchen lab again. So much work to catch up on, but still found time to do a quick experiment. Few years ago I dined at Auberge du Pommier and one of the courses served was, from what I recall, a mushroom soup served in a coffee cup. It was quite delicious. I thought hey, why not take the coffee and mushroom theme a little further. So I did, and here is where the thought of purity vs complexity came into play. I did two trials. On the first one the mushrooms were seared for flavour, then mixed with coffee and more water. 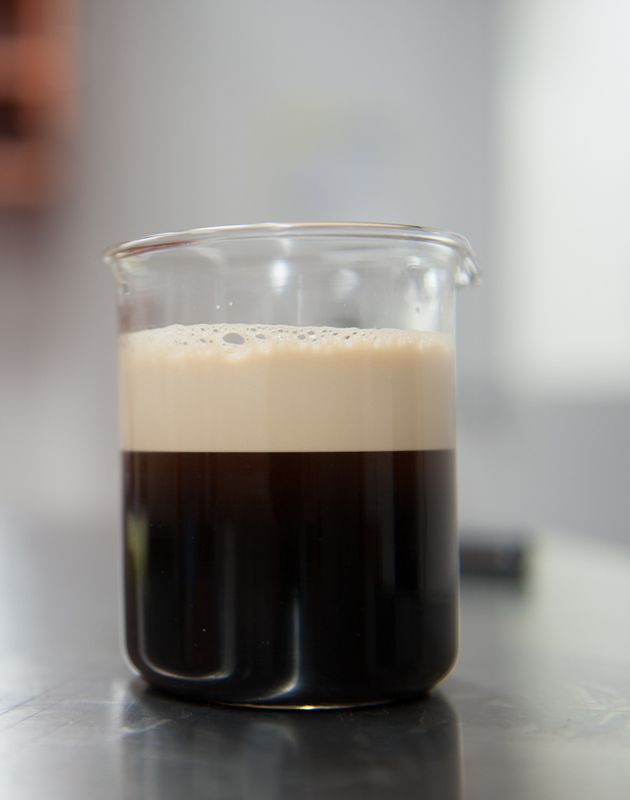 The 2nd trial was with simply making mushroom stock, and mixing the stock with a 3:1 ratio of stock to coffee. In both trials, everything was pureed to increase flavour infusion, then putting them through the centrifuge to remove the solids. At first I thought the trial with the seared mushrooms would be more delicious. However, it was quite the opposite. The batch with the seared mushrooms tasted almost awful, while the simpler one was delicious, had a pure mushroom flavour with a hint of coffee. This is my theory for why I got those results. By removing the solids, all you are left with are the flavour compounds in liquid, which has a much stronger, faster flavour release. So you ONLY have the flavour compounds; nothing to mask/complement/ balance that seared mushroom flavour other than other flavour compounds. Because of this, the bitterness from the searing process really comes out. Remember also that I had some of the mushrooms before I pureed them, and they tasted amazing. I suppose this theory also ties in with other experiments that involve extracting/isolating flavour. Rosemary essence from the rotary evaporator, for example, smells very close to Vicks Vapor Rub. Basil essence tastes like licorice, and it makes sense since its the same flavour compound found in both. I could go on and on, but I’ll keep it till here and end it with a photo of the non-seared mushroom “cappuccino”. There is no dairy in this. The foam was made using a $5,000 non-dairy coffee frother, aka the SonicPrep. That is one of the things I found the SonicPrep to do really well, haha! Wanted to post a quick video on coffee through the SonicPrep. I know, I’ve posted about it before, but this way you get to see what happens. Kinda looks like Guinness right at the end. It has the finest air bubbles, gives a velvety texture to the coffee, and well, makes it look pretty cool! Pretty sure with a little Kahlua or other alcohol it could taste like a porter or stout. Here’s what it looks like after 30 seconds or so out of the SonicPrep. SonicPrep, aka sonic emulsifier, ultrasonic cell disruptor. I like to call it the magic metal rod. I first heard of this piece of equipment from Ideas in Food. I was intrigued by what it can do. I saw that it can emulsify pretty much anything. It can also extract flavours in about 20 seconds. Unfortunately at the time, there was very little information about the SonicPrep elsewhere. Fast forward a few months later, Toronto Food Lab purchased a SonicPrep, and I am glad to tell you that this is truly an amazing piece of machinery. I’d like to share my experience with it, as well as attempt to explain how it works. So, in a nutshell, the SonicPrep works by causing cavitation. 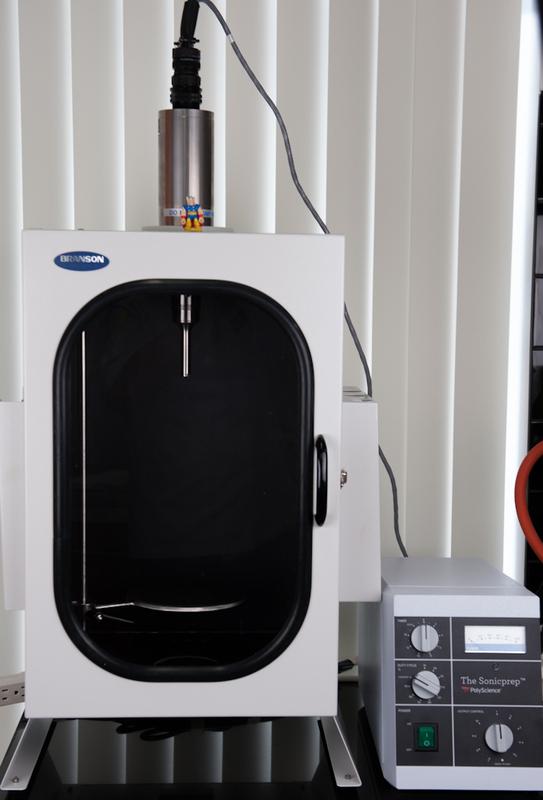 What is cavitation? Well, lets start from the very beginning, and that is the titanium-tipped metal rod that dips into the liquid. The rod vibrates at ultrasonic frequencies and can be controlled via control dial. Imagine the rod’s vibrations pushing and pulling the liquid. First, it pushes the liquid, then the rod pulls back. As the rod pulls back, the liquid is not able to keep up, and as a result, microscopic air bubbles are formed. These air bubbles are in a vacuum, so they want to implode. As they implode, the metal rod is already pushing back, further increasing the force with which the bubbles implode. The tiny implosions cause shockwaves in the mixture. 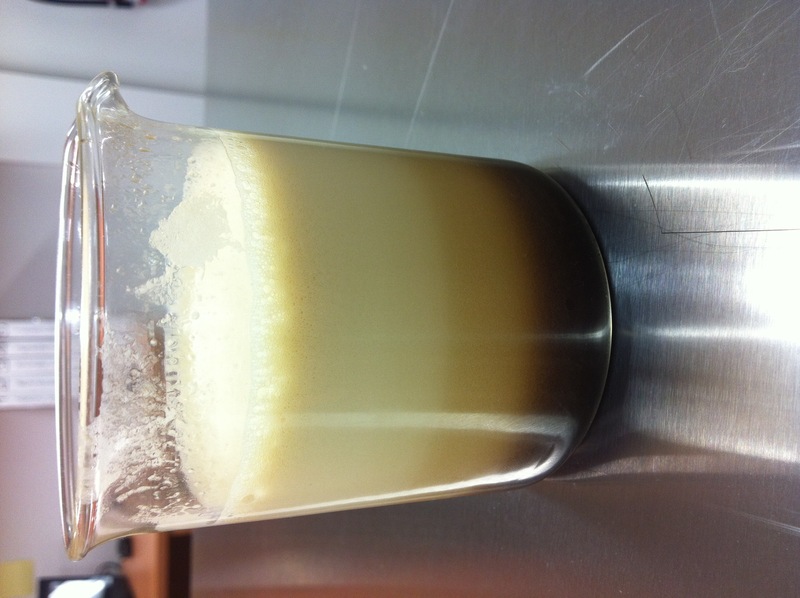 These shockwaves are what disrupt the liquid, causing emulsions and flavour extractions. 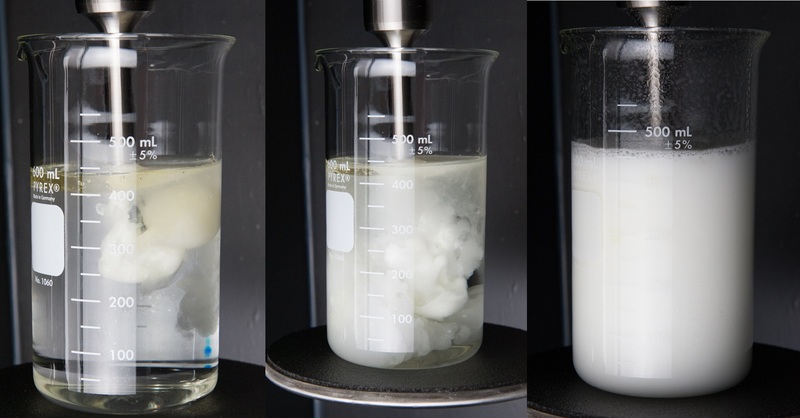 So cavitation, then, is the formation of air bubbles that implode causing shockwaves within the mixture. 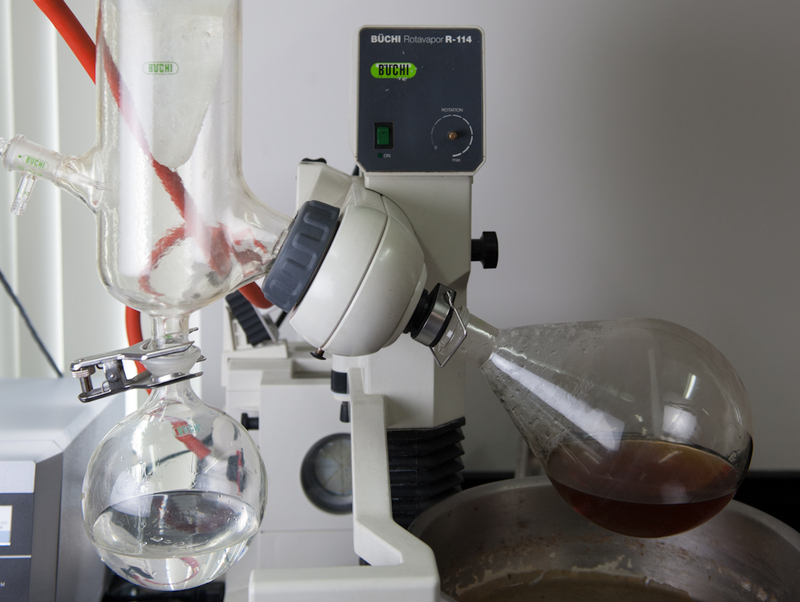 According to PolyScience, the SonicPrep can emulsify, extract flavour, infuse flavour, and intensify flavour, degas, and homogenize. Just those things alone can lead a chef’s brains to go berserk with all the ideas and possibilities. From my personal experience with the equipment, those claims are quite true. Though, I cannot comment on the homogenizing since I haven’t done work that explores that ability. 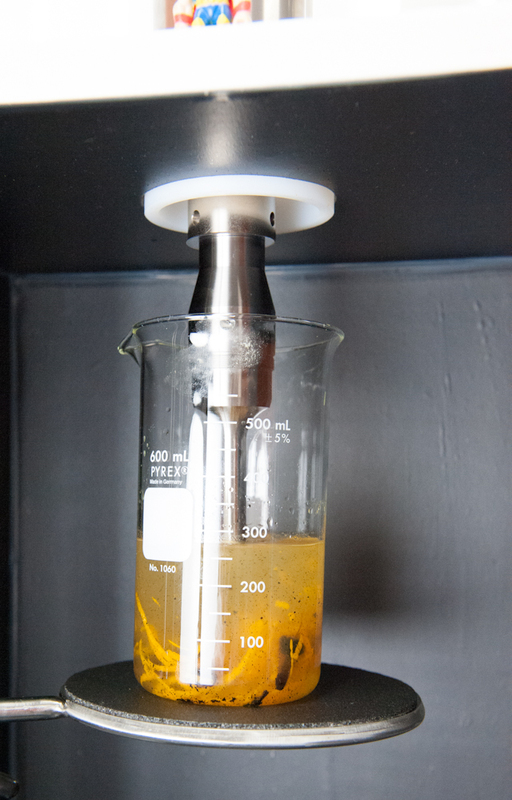 Here’s a quick snippet of canola oil being emulsified. Note, there are no stabilizers or thickeners involved in this particular mixture. Isn’t that crazy?! And its Heat stable to boot! This is coffee being aerated with the finest bubbles. This is just plain coffee, no milk or cream. Other than the visual change, the texture became slightly velvety. 2. Sound box – The sound insulating cage with the clear door. Without this, your ears will hate you. Even with the box, I still need to wear ear plugs. It’s not painful, just uncomfortable. 3. Ultrasonic horn – The metal cylinder and metal rod on top of the sound box. This is where the electric current turns into vibrations. Usually this is done with a quartz crystal. They use quartz because the crystal expands and contracts as you pass an electric current through it. The high frequency of alternating current is what causes the ultrasonic vibrations. 4. Mini Thor – Keeps watch of all those who test the machine. The MOST important component. And that is the SonicPrep! 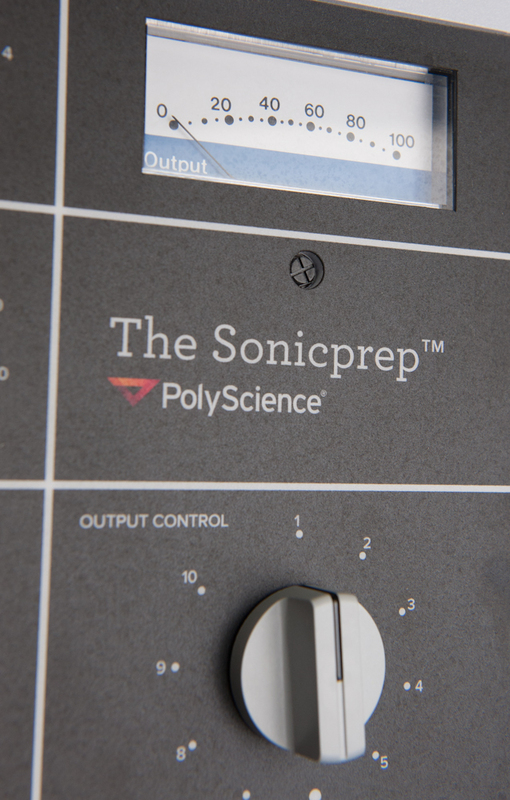 Link to the SonicPrep webpage from PolyScience. Something I made a few weeks ago. Funny how the component that takes the most time to make are the ones that aren’t the center of attention – the reduction and the mushroom butter. So let’s get straight to it. What did I do to the reduction and mushroom butter? Here it is. First, the reduction is made the traditional way of roasting the bones, vegetables, and making a stock from it. Mind you, I think I had equal amounts of bone to water at the beginning. This step alone takes at least 8 hours. I can’t leave the stove turned on overnight so I had to do it over 2 work days. Then collect the stock, and partially reduce it. Just so I can actually put it all in the centrifuge vials. Once that’s done, I centrifuge it to remove all the solids, aka scum. 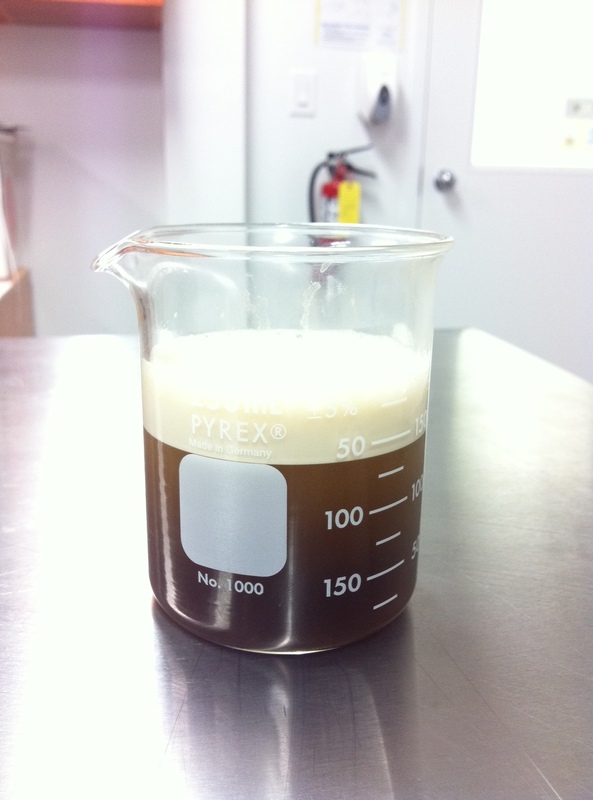 What happens is you now have stock that is free of any solids and has the smoothest mouthfeel ever. After that, reduce it to the point where it resembles tar. That dark, thick beautiful substance that can blow minds. At the end, add a nub of butter, swirl, and done! Well, not quite yet. Put 100ml of that reduction into a beaker, and blitz it in the SonicPrep. Why? It changes the mouthfeel. It makes it even more velvety. Also, it’s not as quick to get sticky when it cools down. The colour also changes into a creamy dark brown. Comparatively, the mushroom butter is less involving. First, brown some portobello and oyster mushrooms. The more browning, the better. Then freeze it overnight before heading to freeze dry for 2 days. Once its as dry as British humour, turn it to dust using a vitamix blender. Then just add it with melted butter. 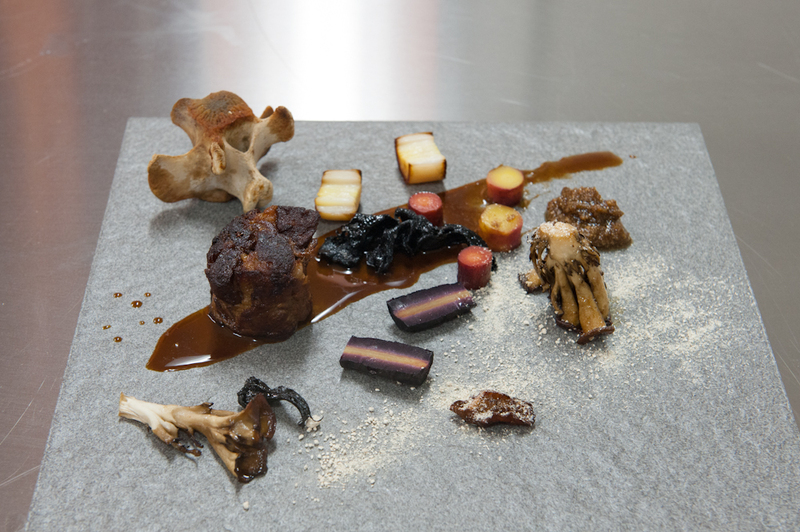 See, I don’t even want to bother talking about the ox tail itself. But let me just say, it was damn good. First post with the new site! 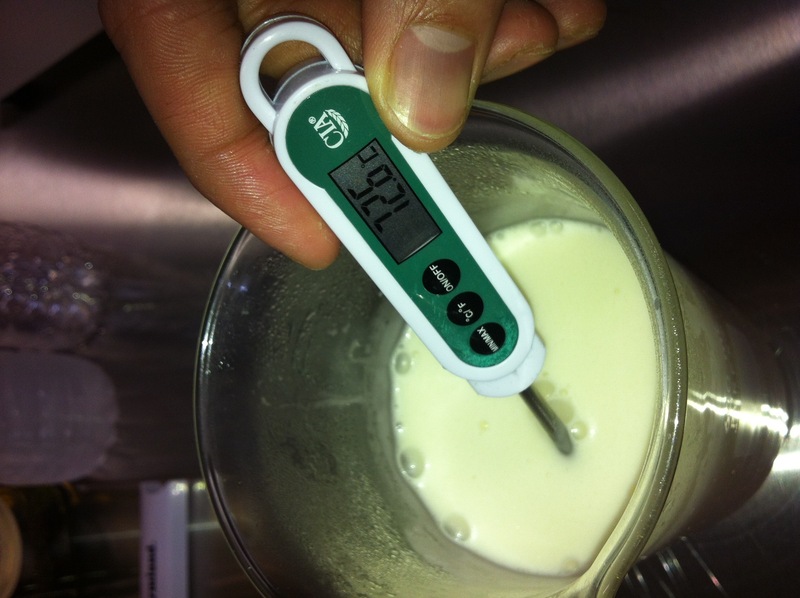 What better way than to celebrate it with some alcohol…rotovaped, sonicated and sous vide. Before we go to that, just need to mention that the old site is still up but will be left like an abandoned insane asylum, sans creep factor. You can find the link up top, entitled previous website (Playing with food and Gel). Without further adieu, here is today’s experiment. 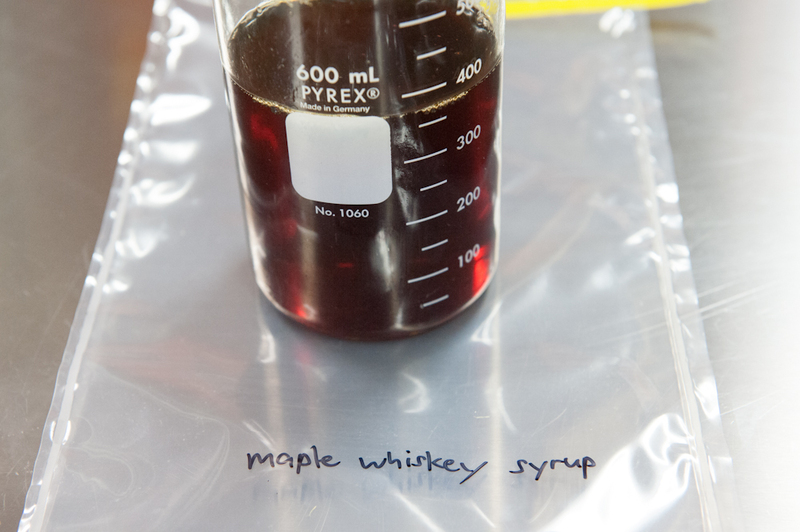 First started with maple whiskey, handcrafted in Canada. I love maple syrup, so it’s no surprise I would also love it in alcohol form. First I distilled it to separate the alcohol and some volatiles from the water. Now I have 2 liquids. On the left is some beautiful alcohol, I imagine it to be at least 80% alcohol. On the right side is what’s left of the whiskey, whiskey flavoured water. The water actually tastes good, unfortunately its lack of alcohol can be associated with whiskey that’s been sitting on ice for over an hour. However, it makes for AMAZING syrup. Here is the alcohol. First through the SonicPrep to disrupt the cells of the vanilla beans and orange zest. What it does is it just allows for more and faster infusion. Think grinding at a cellular level. 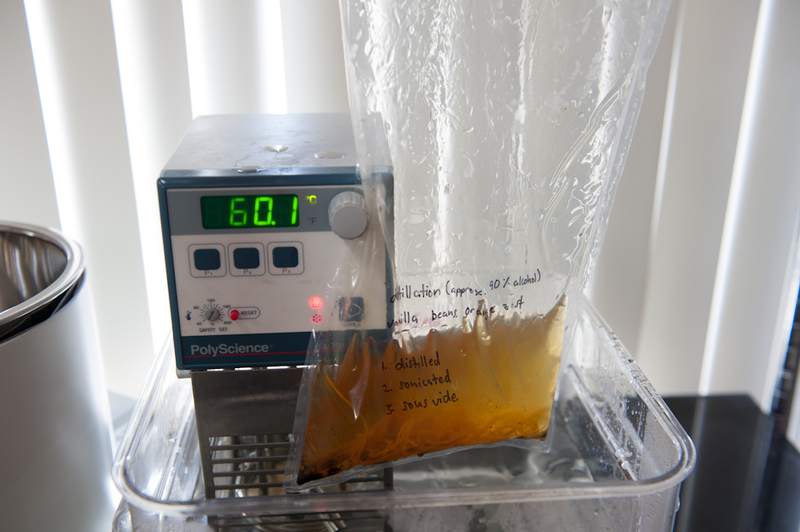 After that, I placed it in a vacuum bag and heated to 60 celsius to infuse for 2 hours. And now for the syrup. This part is the one that actually requires attention. First you caramelize the sugar. I like that nice, dark amber that has a lot more depth in flavour and some bitterness. Once the sugar has reached the right colour, just slowly pour the non alcoholic whiskey and stir. Just LOOK at the colour on that. It tastes amazing to boot! So main question, what does it taste like??? Well, lets start with the alcohol. The stuff is quite harsh at the start. It is some high proof alcohol after all. I wouldn’t drink it like a cocktail, and definitely not a shot. Sip it like a wine and it will reward you! First is the burn, which is expected. It quickly evaporates and doesn’t even reach your throat. The sensation is a bit of a shock. It’s what you get after the burn that makes you go wow. First the orange comes through, and it feels like it’s just floating in your mouth. There’s nothing to chew on, to feel, but you can taste it. Then, that beautiful, unadulterated vanilla arrives, and it just lingers there, almost forever. As for the syrup, think of a very deep, caramel flavour syrup with some hints of maple. You can taste the barrel aging quite well. That, mixed with the bitterness of the sugar comes together wonderfully. I want some Hagen Dazs vanilla bean ice cream now. That’s it for today. Cheers folks!